Hi everyone! 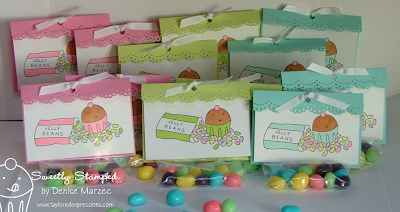 Today I want to show you some party favors I made for my daughter's preschool Easter party. I bought some Smartie-flavored jelly beans at Giant and paired them up with this cute jelly-bean-lovin' cupcake from the Sweet Spring set. All three prism CS colors and the white grosgrain ribbon are from the Easter Key Ingredients pack. - Cut a piece of colored Prism CS to 3-5/8" and score it at 1"
- Add a white panel with your stamped image over the cellophane bag and under the punched edge. My stamped panel is cut to 2.25" x 3". 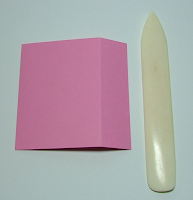 Then just fold over the punched edge, punch a circle with a cropodile, and add your ribbon....that's it! SO ADORABLE, Denise! Love these treats! Those are sooo cute!!! Im sure the kiddos will love them!!! These are very cute...I do love them...but I gotta know..."what is Giant"? I've got to get my hands on smartie flavored jelly beans...smarties are the best candy EVER!!!!! I love them!! Thanks for the great tute!! Very cute!! Love the lace scallop edge, and those images are so cute. OOOH, Denise, I love this idea and your super easy tutorial was awesome to follow. Thank you! Those are so awesome, thanks for the directions. thanks so much for the instructions. love these and can't wait to make favors for my daughter's birthday party!